An Italian Teacher's experience in Antarctica, by Graziano Scotto di Clemente. Italian Translation I am an Italian Science teacher. I am working in a lower secondary school (11-14 year old pupils), for the past 30 years, in Treviso, a town near Venice (North Italy). I am interested in science education, science history, and environmental activities. An Italian Teacher's experience in Antarctica, by Graziano Scotto di Clemente. I am an Italian Science teacher. I am working in a lower secondary school (11-14 year old pupils), for the past 30 years, in Treviso, a town near Venice (North Italy). I am interested in science education, science history, and environmental activities. I participated in the ARISE – Andrill project during the 2007 October/December expedition in Antarctica (McMurdo Station). 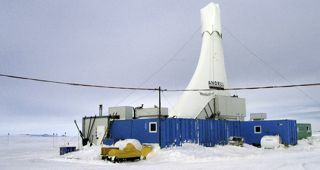 ANDRILL (ANtarctic geological DRILLing) is a multinational collaboration comprised of more than 200 scientists, students, and educators from four nations (Germany, Italy, New Zealand, and the United States) to recover stratigraphic records from the Antarctic margin. The chief objective is to drill back in time to recover a history of paleoenvironmental changes that will guide our understanding of how fast, how large, and how frequent glacial and interglacial changes were in the Antarctic region. Future scenarios of global warming require guidance and constraint from past history that will reveal potential timing frequency and site of future changes. ANDRILL has established an immersion experience for science educators (ARISE) to facilitate development of mechanisms and materials to effectively connect ANDRILL with the public. During the 2007-2008 I planned on conducting a geology field trip and museum visits with his classes to observe and understand the geological evolution after the last Ice Period. I planed to use observations of everyday objects like refrigerators, air conditioners, petrol engines... to build intuitive links among entropy and energy, using software models to study the most important connections among the living beings in a habitat. I planed on doing creative science fiction writing with my class, as well as comic strips and drawings set in critical moments of prehistory or in the future, and presenting collected information and findings of the polar research through simple performances. From Antarctica I worked with some Italian schools on the Polar topics, expecially geology to explain what the Andrill core told to the researchers. For my pupils I prepared some materials on Antarctica, especially to suggest to them some reflections on the hypothetical influences of the climate changes. An interesting didactic experience was organized by the Arise team in the McMurdo Station for the workers of the base. This exibition was created by the group of teachers and scientists who are working in Mc Murdo Station to show and to explain to the other workers and people of the Antarctic base what the significance, the tecnology and the scientific topics of the Andrill project are. For the Arise group it could be a good test of our didactic ideas on a simple itinerary on polar science for pupils. The main challenge: to be able to explain and to show the net of knowledges, the collaborations between different disciplines to understand what happened in the past and what can happen in the future (other informations and photos in http://www.exhibitfiles.org/andrill ). Some materials (in Italian) are on our school website: http://www.scuolastefanini.it (click on “Antartide” in the upper menu). During this year in my school we are working on the CO2 emissions and our carbon footprinters, comparing the “Human habitats” of the pupils of different schools: North Italy, Greece, Poland, Estonia, inside an European project that we have called “SMILe, Science and Mathematics Interactive Learning” (http://smile.kornelowka.com – in progress…). An article written by Graziano on his experience can be downloaded in both English and Italian.